Communities are increasingly looking for new sources of capital and ways to unlock existing ones so that they can be put toward community needs, like affordable housing, renewable energy, food system development, job creation and local business development and more. Community-sourced capital projects are an important part of a new movement for social finance that is taking off in Canada and across the world. Social finance is an approach to raising capital and investing that focuses on creating a strong social return to our communities, as well as a financial one. 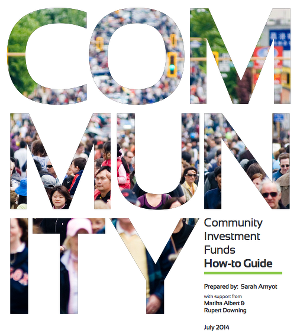 This guide has been developed based on research and the experience creating a Community Investment Fund on Vancouver Island. This is a new area of work for many communities, organizations and volunteers and the process of starting up your own community sourced financing vehicle is challenging and complex. This guide is meant to help ease the process and provide a starting point for other communities throughout BC and elsewhere that are interested in developing their own community-sourced financing tools. What Does All of This Mean for Your Project?